Will New York Elect a Progressive Marxist? 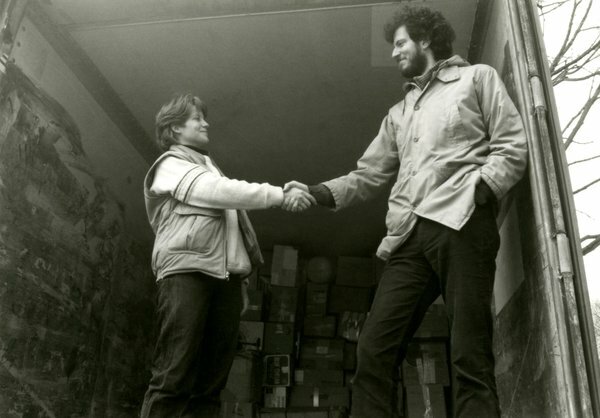 NYT/Marquette University Archives: Bill de Blasio with Katharine Lewis at a news conference in 1988 held by the Quixote Center, a social justice group, to announce a $150,000 shipment of supplies to Nicaragua and to deride the United States’ financing of the contra rebellion. What does it say about a major city when the candidates for the Democratic Party are so bad, that the bald faced Marxist looks good? Instead of Weiner (a pervert) or Christine Quinn (a gay Progressive in Bloomberg’s pocket), the Dems chose Bill de Blasio (a New York City Public Advocate and an in-your-face Marxist) — the most radical of the bunch. But Mr. Lhota doubled down today in far harsher words—calling on Mr. de Blasio to “explain himself” and equating Mr. de Blasio’s views with communism. “Bill de Blasio needs to explain himself – and explain himself now – to the hundreds of thousands of New Yorkers who escaped Marxist tyranny in Asia, Central America, and from behind the Iron Curtain in Eastern Europe,” he said in a statement. The scruffy young man who arrived in Nicaragua in 1988 stood out. He was tall and sometimes goofy, known for his ability to mimic a goose’s honk. He spoke in long, meandering paragraphs, musing on Franklin D. Roosevelt, Karl Marx and Bob Marley. He took painstaking notes on encounters with farmers, doctors and revolutionary fighters. But a review of hundreds of pages of records and more than two dozen interviews suggest his time as a young activist was more influential in shaping his ideology than previously known, and far more political than typical humanitarian work. So, New York, are you going to paint yourself red and go all the way? Will you elect a Progressive Marxist to lead you into a new dictatorial future? Why does anyone stay there any more? Between taxes, regulation and Marxism, New York is beginning to feel a lot like Cuba or maybe better yet, Russia.